What evidence did runaway slaves leave behind at an Underground Railroad station? What tools help an archaeologist uncover and identify that evidence? Is slavery itself an historic artifact? This new exhibition at the NIU Anthropology Museum presents a fresh perspective on slavery as seen through the lens of anthropology. Based on the excavations of former NIU graduate student Lisa Brown, the exhibit highlights the archaeological study of the Underground Railroad and the injustice of slavery. Curated by current NIU graduate students Kweku Williams and Ashlee Craig, this powerful exhibit demonstrates the many ways in which anthropology transforms lives. Acknowledging the emotionally charged theme of the exhibit, curators Williams and Craig emphasize the role anthropologists play in detecting economic and social injustices. 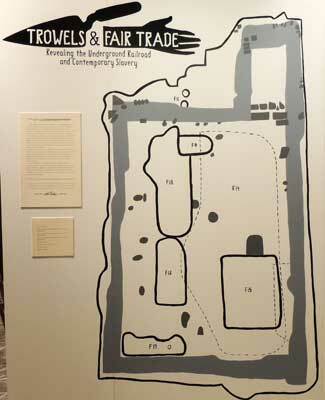 “Trowels and Fair Trade: Revealing the Underground Railroad and Contemporary Slavery” underscores the work of NIU professor Mark Mehrer and Brown in using archaeological evidence to identify Underground Railroad stations. The exhibition includes slave shackles from circa 1850. Interactive stations throughout the exhibit provide visitors an opportunity to conduct archaeological field work, play the Trivia Challenge and become a contemporary abolitionist. The exhibit is open from 10 a.m. to 4 p.m. Tuesdays through Fridays through Oct. 12. Admission is free. Founded in 1964 by the Department of Anthropology in the College of Liberal Arts and Sciences, the Anthropology Museum houses a permanent collection of more than 12,000 ethnographic and archaeological objects. For more information, contact Jennifer Kirker Priest at (815) 753-2030 or jkirker@niu.edu.